The Hopbine — it took some wrestling with the word processor to prevent this from becoming ‘The Hipbone’ — was a cavernous pub in north London where British sax legend Tubby Hayes often played. Gearbox Records have previously issued a 1972 Hopbine session by Tubby (reviewed here), but this latest release is particularly interesting. It is closer to what most regard as the tenor player’s prime period — indeed 1968 is the year Hayes released his immortal album Mexican Green. And this recording also has a somewhat unusual line-up in that, along with Kenny Baldock on double bass and Spike Wells on drums, it features the Irish guitarist Louis Stewart, who has played with George Shearing, J.J. Johnson and Niels-Henning Orsted Pedersen. It’s a firecracker of a quartet and one which could never before be heard on a legitimately released recording. The record goes from nought to sixty in the blink of an eye with The Syndicate, a Tubby Hayes original offering no-nonsense, fast, breezy bebop. Out of the dense, flashing intro Tubby emerges sounding sweetly tuneful and incisive. Louis Stewart smoothly supports the leader on electric guitar before launching into a chunky, fuzzy, chopping solo. The Gentle Rain, a bossa nova classic by Luiz Bonfá, is a radical change of pace and a gem of a selection, with Tubby showing what he can do in territory that Stan Getz seemed to have staked out as his alone. He blows airy bossa strains, effortless and affecting. Stewart’s racing, ringing electric guitar alternates fast bop lines with strumming in a modified flamenco style. Spike Wells keeps shimmering time on cymbals and Kenny Baldock plays twisting, full bodied bass. Gingerbread Boy, a Jimmy Heath composition, is a feature for Stewart in a very different mode, playing lightning boppish lines which puts the leader on his mettle. Hayes rises to the occasion and shows his extraordinary speed and agility with Spike Wells galloping like a race horse alongside him. Tubby concludes with some good humoured Dizzy Gillespie style flourishes. 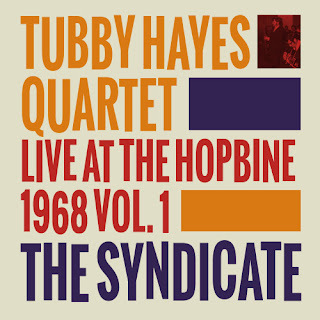 The Inner Splurge is another Tubby Hayes original, and the title is an irreverent reference to The Inner Urge a 1966 composition, and Blue Note album, by Joe Henderson. Tubby’s tune is fierce and frantic hard bop with Stewart and Wells alternating in bursts of machine-gun-fire riffing. Hayes remains the master of ceremonies, though, always guiding the music back to the theme, and performing a tyre-scorching stop to conclude the piece. Slowly filling all the gaps in my Tubby Discography collection, this one I've just lifted the needle off. I had initial concerns about cassette sound via an lp, and those suspicions are correct at first, but either the ears adjust or the sound improves. It turns out to be a major session, and perhaps even a highlight of Tubby's output, with a perfect partner in Louis Stewart. This is at least as good as anything happening on the jazz scene in the States that year, better than most. I am with you all the way Andrew, thanks for the push towards buying this.